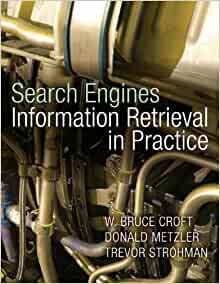 Search Engines: Information Retrieval in Practice is ideal for introductory information retrieval courses at the undergraduate and graduate level in computer science, information science and computer engineering departments. It is also a valuable tool for search engine and information retrieval professionals. Written by a leader in the field of information retrieval, Search Engines: Information Retrieval in Practice , is designed to give undergraduate students the understanding and tools they need to evaluate, compare and modify search engines. Coverage of the underlying IR and mathematical models reinforce key concepts. The book’s numerous programming exercises make extensive use of Galago, a Java-based open source search engine. KEY BENEFIT: Written by a leader in the field of information retrieval, this text provides the background and tools needed to evaluate, compare and modify search engines.KEY TOPICS: Coverage of the underlying IR and mathematical models reinforce key concepts. Numerous programming exercises make extensive use of Galago, a Java-based open source search engine.MARKET: A valuable tool for search engine and information retrieval professionals. It's great for introduction to the Information Retrieval. The former part of the book is filled with very good idea and clues for the information retrieval, for example, the characteristic of word or text, rank, page | site revisits, rough search engine architecture. But the latter part of the book is so~so~. The equations are good but the book doesn't explains the derivations of them and it seems that the book almost just lists the summations of the the Page Rank or Word Rank up. This is a textbook I use in information systems graduate school. It's the kind of book you open and suddenly feel sleepy. The information is well organized and there is an online website, but I often have to go looking elsewhere for less wordy explanations. AN economy of words is not the books strong suit. I am, however, learning a lot... especially throwing other sources into the mix. The math is not too bad: statistics and baby calculus. 5.0 out of 5 starsgreat book, great condition, strongly recommend. I thought I already reviewed this one, whatever. Great book, and in great condition. It's really likely new, it has maybe 3 or 4 pages that's a little bent, you can easily get rid of that. No missing pages, the cover is clean and has no scratches. The book itself is instructive and helpful, maybe the best one in Information Retrieval field. Very easy to read and practical book. Probably the best book on the subject of information retrieval, despite being a few years old. Includes a good mix of theory and practice. 2.0 out of 5 starsit was bad. If I could pick up some spelling errors in a textbook, it was bad. This book was good for my class but I believe it will constantly have to be updated due to the growth of new technology and retrieval systems.